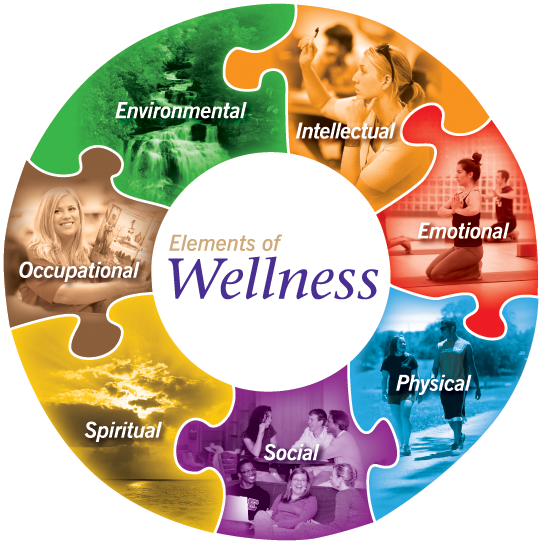 The concept of wellness moves the definition of health and well-being away from a mindset based in the management of disease and into the areas of prevention and proactive strategies. Active aging embodies the philosophy that individuals can live as fully as possible within the seven dimensions of wellness. All elements of wellness overlap and coordinate to provide rich environment for living. Wellness becomes a framework that is valuable for serving the wants and needs of a person engaged in life. Balancing these elements is the key. Feelings are the lens through which people view the world, and the ability to be aware of and direct one’s feelings helps to create balance in life. Coping with challenges and behaving in trustworthy and respectful ways signal emotional wellness, attributes that can be encouraged through peer counseling, stress management, humor/laughter and personal histories. Engaging in creative pursuits and intellectually stimulating activities is a proven approach to keeping minds alert and interested. There are many ways to stay intellectually active, including taking college courses, journaling, painting or joining a theater company, and challenging oneself with games and puzzles. The goal of living independently is one shared by many people, and physical wellness is necessary to achieve this. Lifestyle choices that can maintain or improve health and functional ability include engaging in physical activity, choosing healthy foods with adequate nutrition, getting adequate sleep, managing stress, limiting alcohol intake, not smoking, making appointments for check-ups and following medical recommendations. Work that utilizes a person’s skills while providing personal satisfaction is valuable for society as well as the individual. Participating in the paid and unpaid workforce means maintaining or improving skills, and helping others. Older adults contribute to society as experienced professionals, caregiver, mentors, teachers and volunteers. Leisure-time vocations in the arts and through hobbies maintain vocational skills. Social interactions with family, friends, neighbors and chosen peer groups can be valuable for maintaining health. Personal contact by joining clubs, traveling, visiting friends and family, engaging in intergenerational experiences like making quilts with a elementary school children is beneficial for everyone who it touched. Living with a meaning and purpose in life, guided by personal values, is key to feelings of well-being and connection to the larger world. Group and individual faith-based activities, personal meditation, mindful exercise (yoga, tai chi) and experiencing nature can open create the opportunity for spiritual growth. Surrounded by natural and man-made environments, good stewardship means respecting resources by choosing “green” processes that re-use and recycle goods. It also means looking at ways to bring people into the natural environment and encourage active living through urban and property designs emphasizing walking paths, meditation and vegetable gardens and similar options.